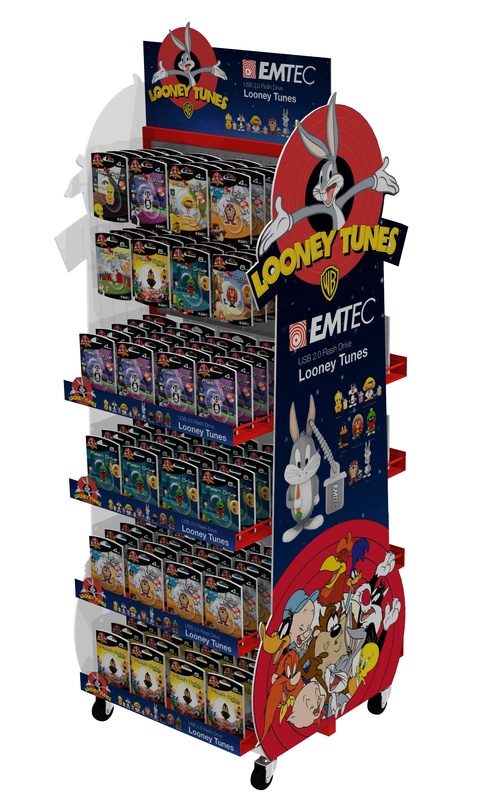 A successful POP display should be functional, cost-effective, and attractive. The simple goal of today’s post is to provide examples of various ways in which POP displays can be dressed up to make them more attractive. Attractive displays can lure more shoppers and sell more product so it is often worth the incremental investment to dress them up. In most cases, we rely on graphics to increase the visual impact of a display and make it more attractive, but sometimes using different materials or interesting finishes can get the job done. Let’s take a look at a few examples. 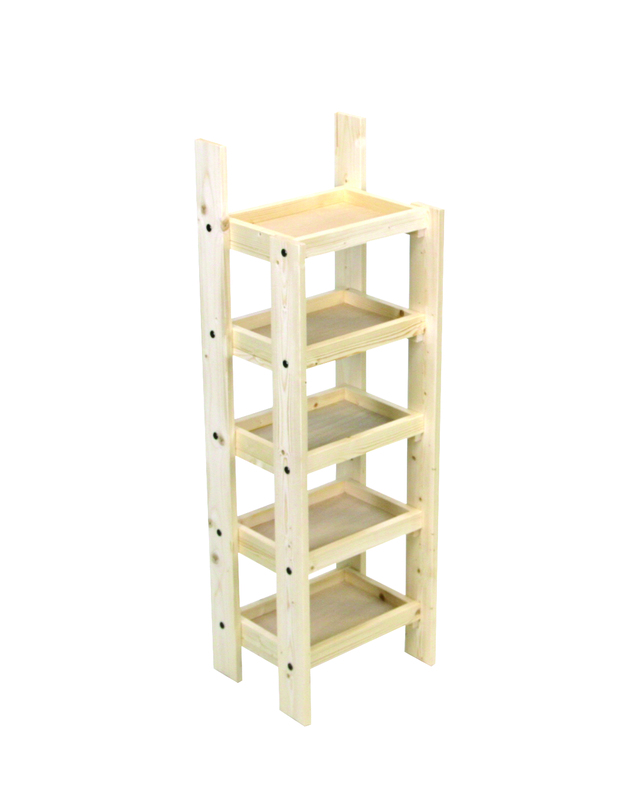 The picture below shows one of our very basic stock wood shelf displays. We took our stock display, eliminated a couple shelves and dressed it up to look like a red barn that is associated with the Glacier Distilling brand. 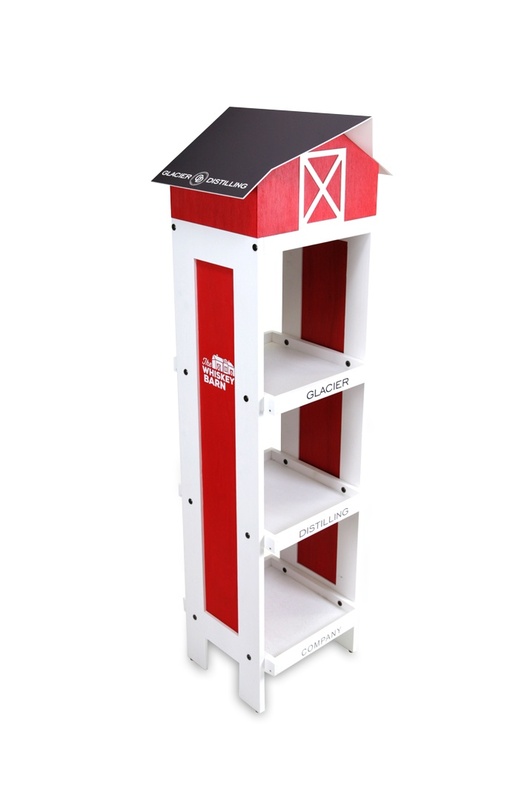 We incorporated side and shelf graphics and added a PVC roof with a digitally printed graphic to completely transform an ordinary shelf display into an eye-catching, brand-building display. Our second example shows some less dramatic transformations of one of our stock floor cap displays. Our stock unit is shown below. The picture below shows the same display with a simple header sign and an extended rear panel sign that features lifestyle graphics. 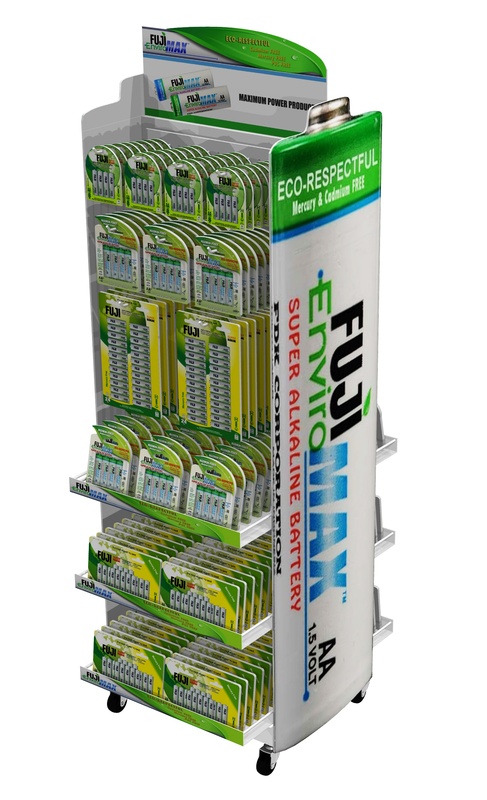 These types of displays typically have header signs, but the addition of the extended rear panel sign is a bit more unique and offers a great opportunity to provide additional messaging and lifestyle imagery which helps to reinforce the brand’s identity. The example below shows a very similar floor cap display dressed up with header and base graphics, but in this case, we added branding to the sides and front of the cap pockets to create a more heavily branded display. 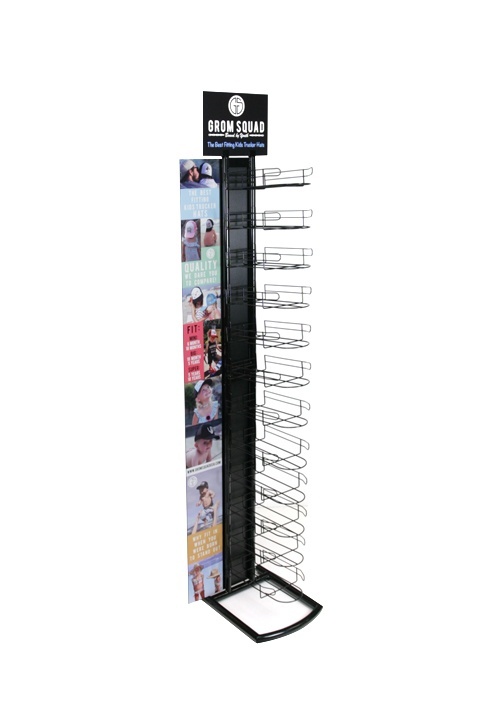 Our next example is a simple 2-sided slatwall display we made for Blowfish. Slatwall is common in the industry and popular for its universal functionality, but it is typically pretty boring. We dressed it up by applying graphics to both sides of the display, which gave it a completely different look. 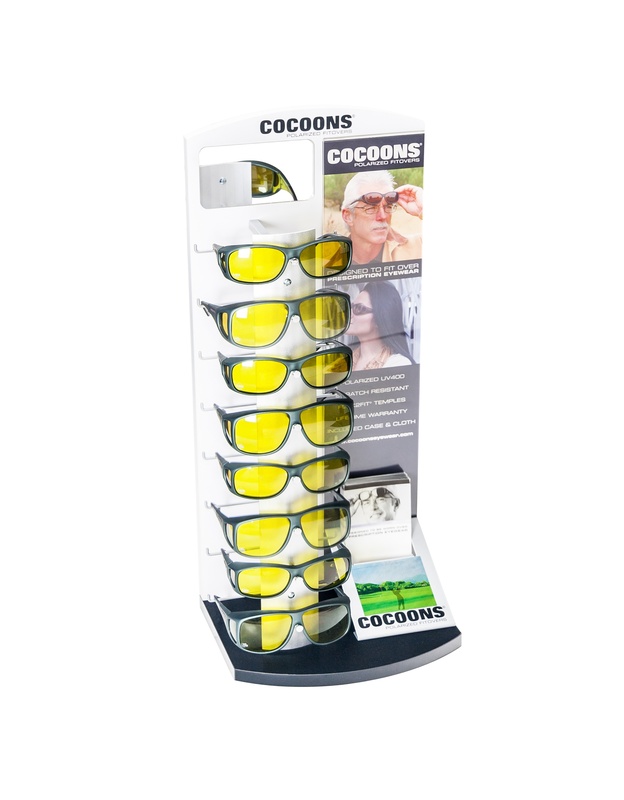 The Cocoons eyewear display shown below could have been boring since its MDF structure is so simple. But, we dressed it up with a mirror, back panel graphics, and angled acrylic brochure holder. 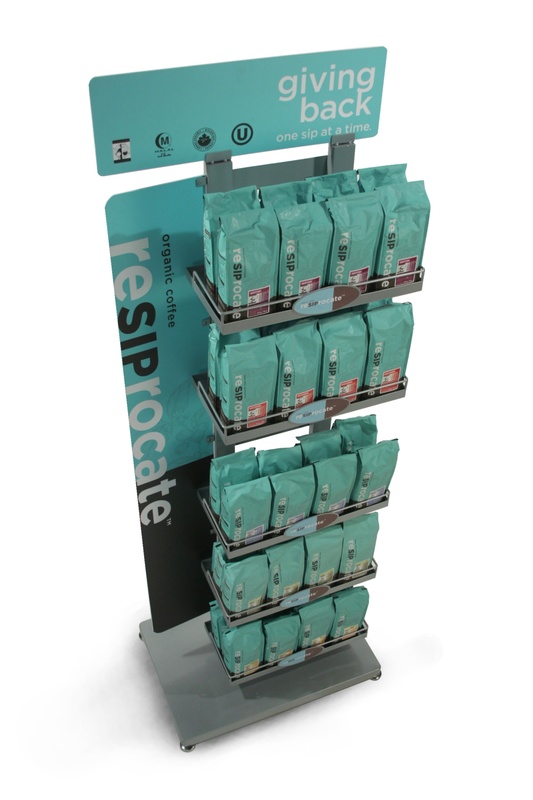 Our next example is the Resiprocate coffee display shown below which is just a basic sheet metal and tube display. 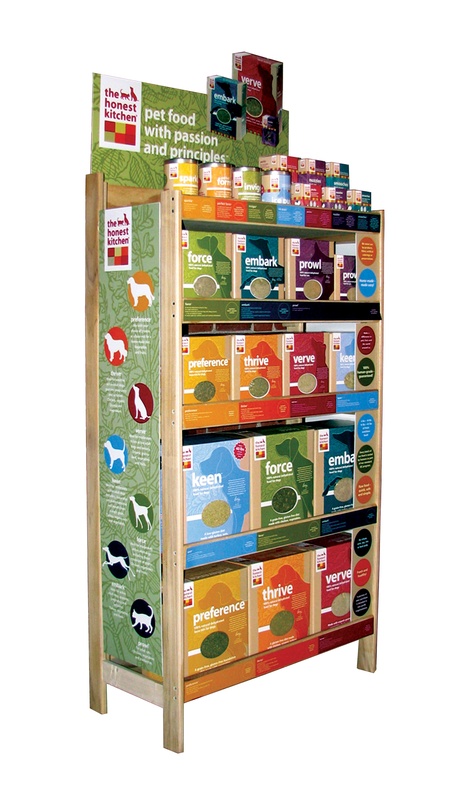 However, we used color-coordinated header, side, and shelf graphics that tied in with the product packaging to make the display visually appealing. The next three examples utilize the same metal tube and wire structure. These examples are all about showing how graphics can transform a very basic display to the point where all you see is the product and the graphics. Getting the customer to focus on the brand and the product and having the display disappear is really the ultimate goal. In a similar way, we have used graphics to dress up wood displays. The example below of The Honest Kitchen display shows how header, side, and shelf graphics can transform a basic wood display. 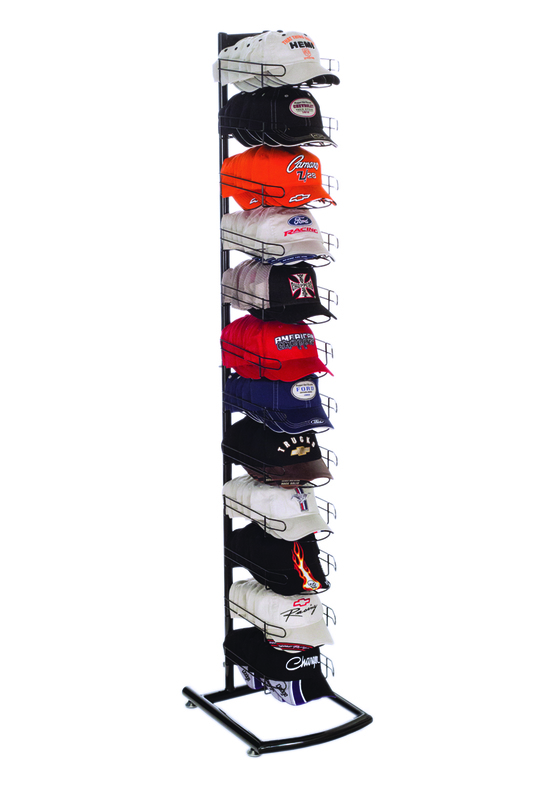 Like slatwall, pegboard is commonly used in the display industry because of its functionality and versatility. Pegboard generally does not win many beauty contests. 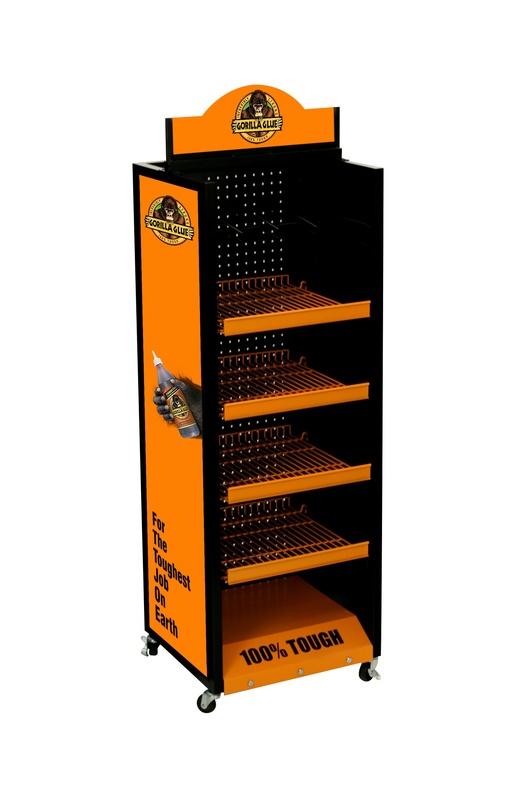 The Gorilla Glue floor display below shows how a basic metal tube frame with a black pegboard back panel can be dressed up with a combination or orange powder coated shelves, screen printed sheet metal base graphics, PVC side signs, and a die-cut PVC header sign. 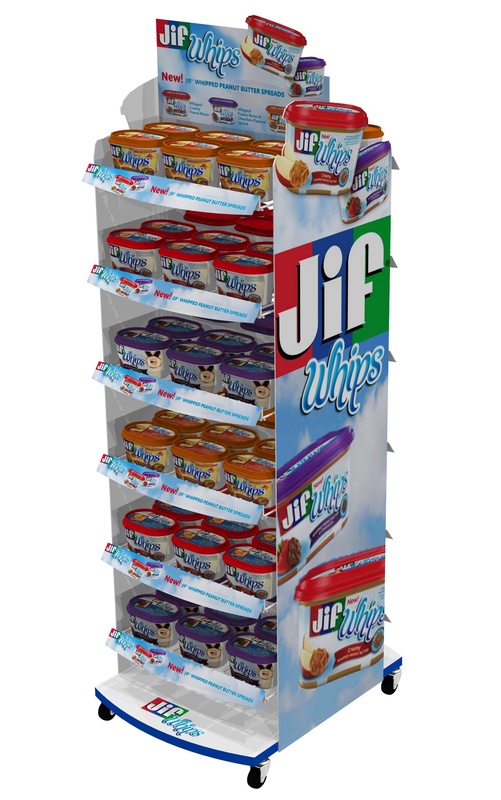 When loaded with product, this display sends a strong brand message. Sometimes we use color and certain material choices to dress up a display and make it stand out. Such is the case with the Cherished Girl T-shirt cubby display shown below. In this case, we used a hot pink laminate and plentiful graphics to make the display an attention-grabber. Our next two examples show how wood finishes can often dress up a display or make it stand out. 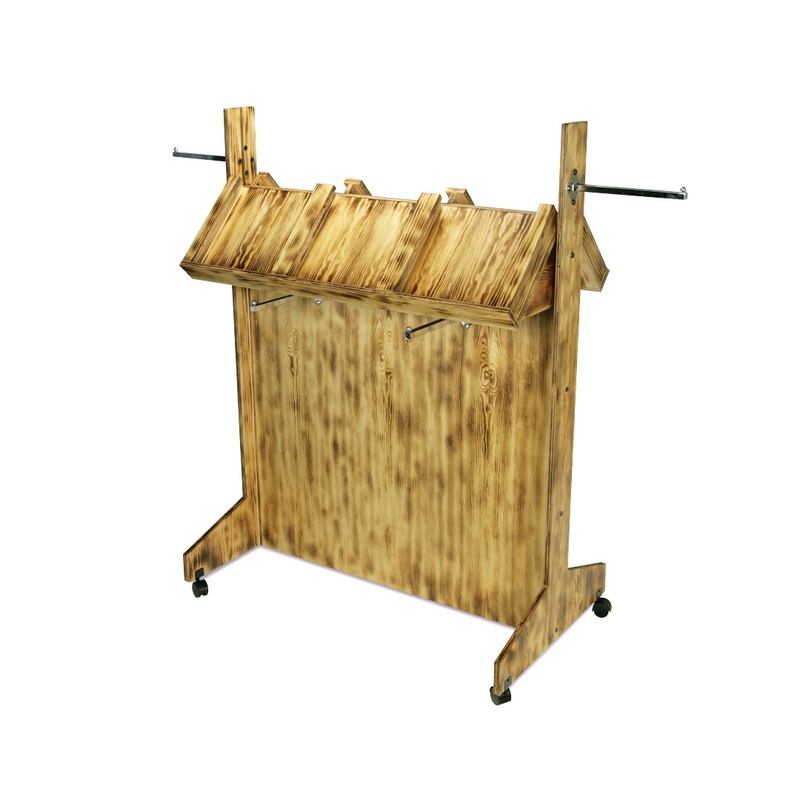 The first example is an apparel floor display that we built and finished with an unusual combination of stain and torching. 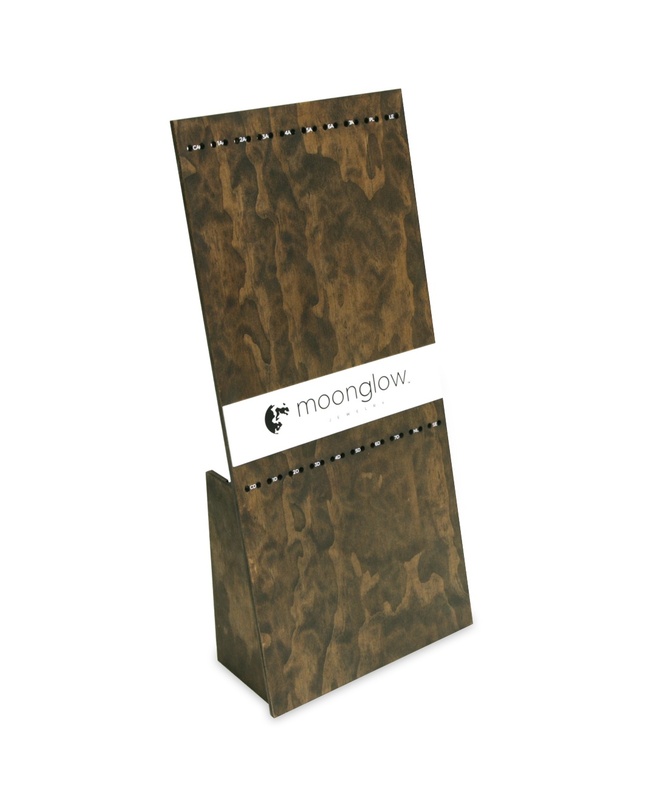 The second example below is a countertop display we made for Moonglow that has more of a mainstream finish, but it is different enough that it draws your attention. Our final example shows a glorifier stand we designed and manufactured for Zodiac Pool Systems. The main way we dressed this stand up was to cut out the 3D letters on the side of the stand. In addition to the die-cut header graphic, we also finished the MDF structure with a powder coated finish instead of using a melamine, laminate or painted finish. It’s not really apparent in the picture, but the powder coated MDF provides a bit of a textured finish that is not only durable but helps the display stand out. We hope that some of these examples will provide inspiration for dressing up your next POP display.